Another home game and another win, continued the clubs success in 2013, with every match won this calender year! For this match, the skipper threw in a curve ball, by sitting out the match himself and watching his fellow players ably dismantle a very friendly and game St Marys side. Mark and Paul continued their partnership with three more comfortable wins. Delwyn and Mark Pridmore joined forces for the first time this season and got their monies worth with two three enders, winning one and losing one. Meanwhile, Pete Dee had a very dull evening by his own standards, as he and Dave Brew cruised to three easy wins in straight ends, most ‘Un-Dee’ like! It appears he may have passed the mantle of ‘Mr Three Ender’ along to Delwyn! 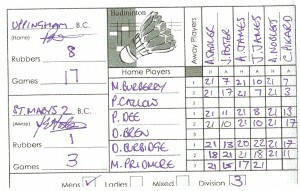 Well played everyone – still unbeaten, going into a tough away fixture against Apollo on February 10th, thats right, a Sunday, at 11am!